Ship Watchers offers our clients an option when it comes to our Freight Payment Solution. Clients of Ship Watchers that utilize our Invoice Auditing Solution will not incur any additional expenses if they elect to utilize Ship Watchers as their Freight Payment Vendor. Given our technologically advanced web portal platform clients will have complete visibility into our entire audit and payment process. Carrier invoices will have a “status” associated with them as they go through the auditing process indicating when they are ready for payment. Sorting can be done by numerous drop downs including by date, status, carrier, country, client ID, etc. for easy exportability and viewing. Carriers will have their own web portal login platform for complete visibility into invoicing, documents, and payment status. Increase efficiency and reduce labor intensive Freight Payment procedures with our Freight Payment Solution covering Small Parcel, Freight, Ocean, Air, and Rail Invoices in several languages and over 34 currencies (EMEA, NA, LA, APAC) Globally. On average it would cost a large company $11 to pay each carrier invoice, whereas outsourced Freight Payment vendors would charge between 1% and 3%. Our first option to clients is to keep your Freight Pay internally utilizing our Payment Dashboard and any scripting required to link with your own internal accounting platforms. Our Development Team works with our clients to customize a solution that fits into your current internal accounting platform. You would have complete control over all payments made to your carriers and a peace of mind that they are correct given our auditing solution. eAlert systems are in place to provide email notifications when invoices are ready for payment. You will have complete visibility into the status of each freight invoice with update, search, sort, and export capabilities. 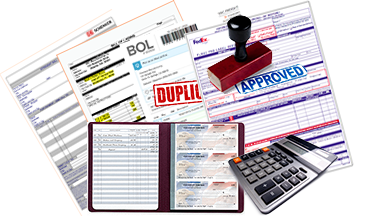 Clients utilizing our online payment feature for freight invoices will be given the “Audited” invoices for payment. An Authorized user must approve the freight invoice for payment by logging in and selecting “Approved to Pay” on each invoice in question (select "all" feature available). Once approved, Ship Watchers will release payment within 1 – 3 business days to the carrier for payment of that invoice unless alternative payment terms are negotiated by the carrier and client. Payment information is recorded online and is available for review at any time after the payment has posted from our accounting department. Each client is setup with a separate bank account to avoid co-mingling of client funds. In addition, any transactions paid by an account setup by Ship Watchers must have two authorized signatures to process. Ship Watchers has years of experience in developing a Freight Payment platform that is customizable at the option of the user and provides valuable insight and tangable evidence into your small parcel and freight invoice expenditures. Processing thousands of invoices monthly, our Network has the capability to insure freight payment accuracy for business intelligence, cost allocation, and expedited payment of small parcel and freight invoices. Imagine having all your shipping data and invoices located in one place for you to pull any reports, use one touch bill payment or to review all surcharges from one carrier. Our online portal allows you real time visibility over the entire auditing process and access to all the carrier information located on each invoice whether small parcel, LTL, TL, Ocean, Rail and/or Air. Beginning from day one, our intelligence Network will be there to insure you are in control of all payments to your carrier(s).